How do you imagine the future to look like? With the gamestorming method "Cover Story" - explained here by Dave Gray - we would like you to envision and imagine your ideal future of corporate digital learning. 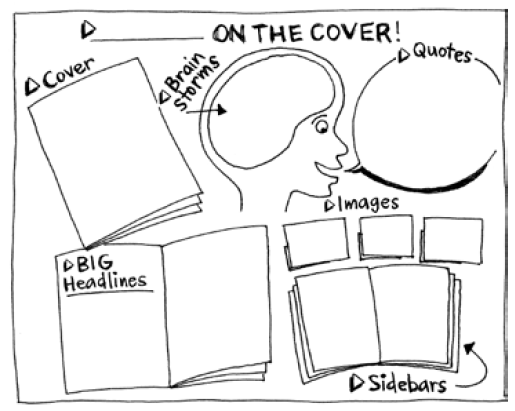 You can create your own magazine cover page, use the gamestorming image as inspiration, or come up with something completely different and new. Just show us your wildest dreams! Usually, this game is played collaboratively, but we want to put the focus on the discussions and comments after. So make sure to share your journal entry and have a look at other journals as well. This game is based on The Grove Consultants International’s Leaders Guide to Accompany the Cover Story Vision Graphic Guide® ©1996–2010 The Grove. Ps: There is also an online version of Cover Story, you can play here. Need some inspiration on how the future could look like? Watch this video by The CGBros! I Imagine the future as innovative, unpredictable,and adventurous. I think that everything in the future will be digital.